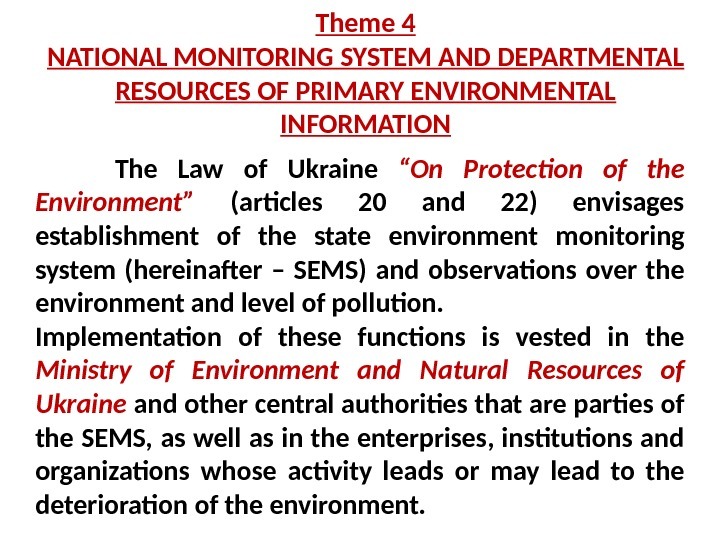 Theme 4 NATIONAL MONITORING SYSTEM AND DEPARTMENTAL RESOURCES OF PRIMARY ENVIRONMENTAL INFORMATION The Law of Ukraine “On Protection of the Environment” (articles 20 and 22) envisages establishment of the state environment monitoring system (hereinafter – SEMS) and observations over the environment and level of pollution. 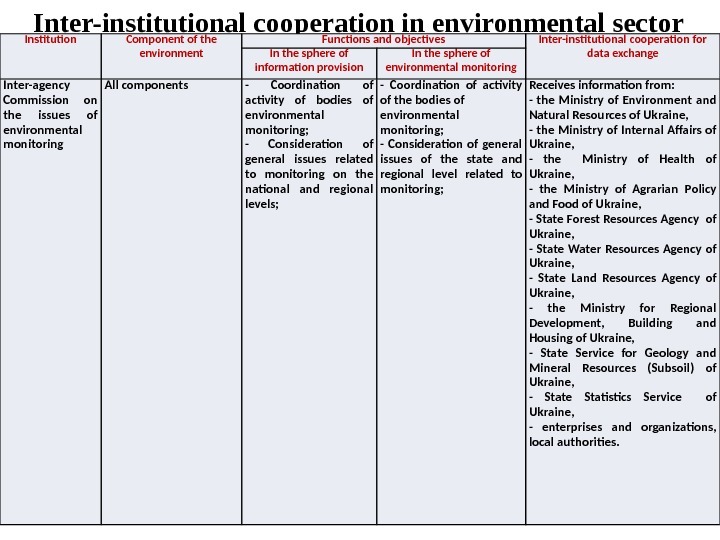 Implementation of these functions is vested in the Ministry of Environment and Natural Resources of Ukraine and other central authorities that are parties of the SEMS, as well as in the enterprises, institutions and organizations whose activity leads or may lead to the deterioration of the environment. 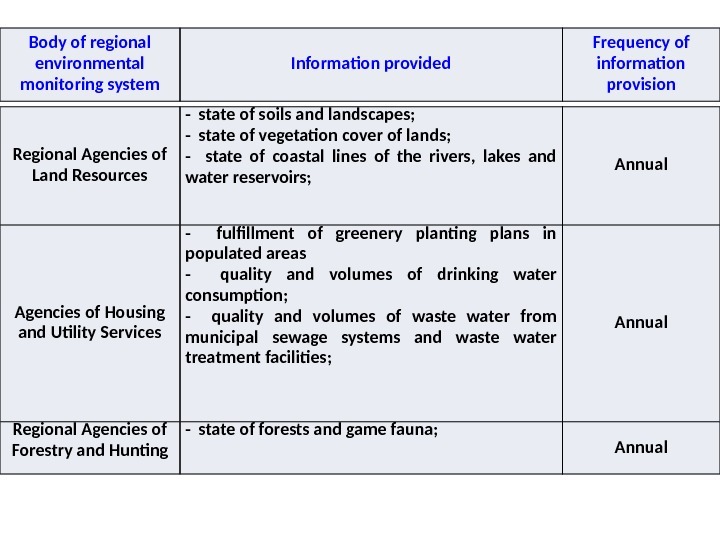 The main goals of SEMS are provision of observations, collection, processing, transfer, storage and analysis of information about the state of the environment, prediction of its changes and development of scientifically grounded recommendations for the management decisions in the sphere of environment protection, rational use of natural resources and environmental safety. 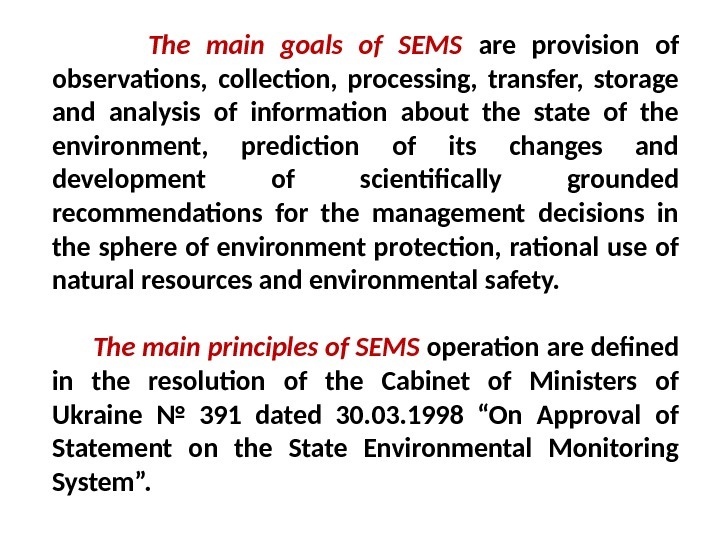 The main principles of SEMS operation are defined in the resolution of the Cabinet of Ministers of Ukraine № 391 dated 30. 03. 1998 “On Approval of Statement on the State Environmental Monitoring System”. 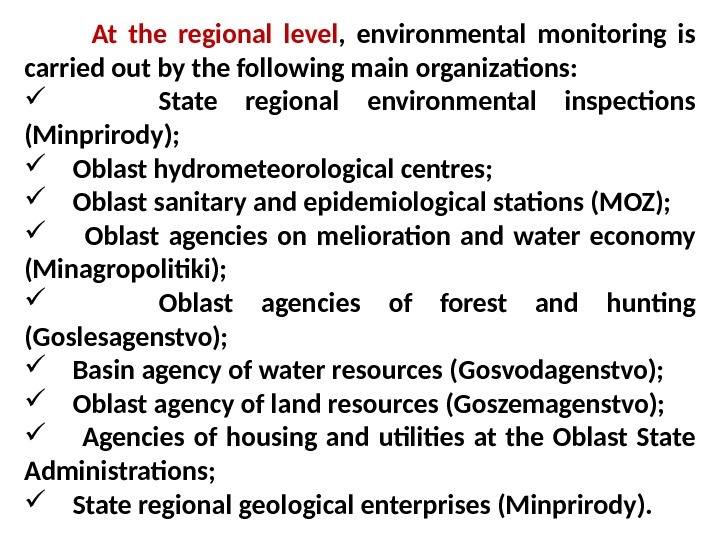 At the regional level , environmental monitoring is carried out by the following main organizations: State regional environmental inspections (Minprirody); Oblast hydrometeorological centres; Oblast sanitary and epidemiological stations (MOZ); Oblast agencies on melioration and water economy (Minagropolitiki); Oblast agencies of forest and hunting (Goslesagenstvo); Basin agency of water resources (Gosvodagenstvo); Oblast agency of land resources (Goszemagenstvo); Agencies of housing and utilities at the Oblast State Administrations; State regional geological enterprises (Minprirody). 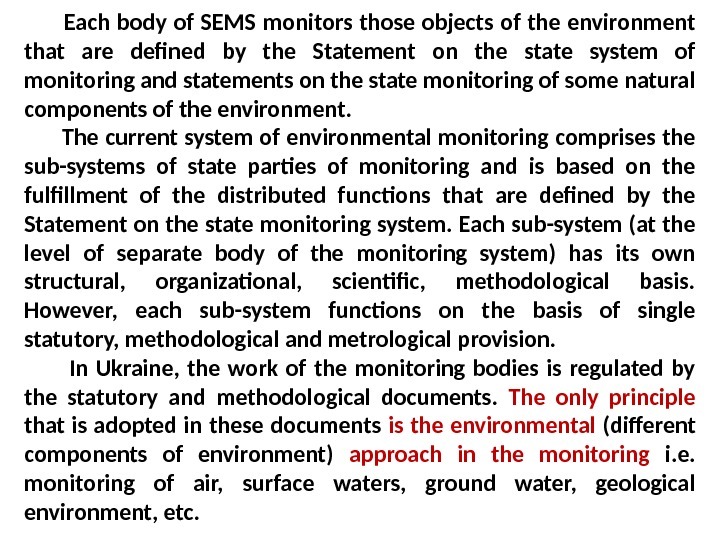 Each body of SEMS monitors those objects of the environment that are defined by the Statement on the state system of monitoring and statements on the state monitoring of some natural components of the environment. The current system of environmental monitoring comprises the sub-systems of state parties of monitoring and is based on the fulfillment of the distributed functions that are defined by the Statement on the state monitoring system. Each sub-system (at the level of separate body of the monitoring system) has its own structural, organizational, scientific, methodological basis. However, each sub-system functions on the basis of single statutory, methodological and metrological provision. 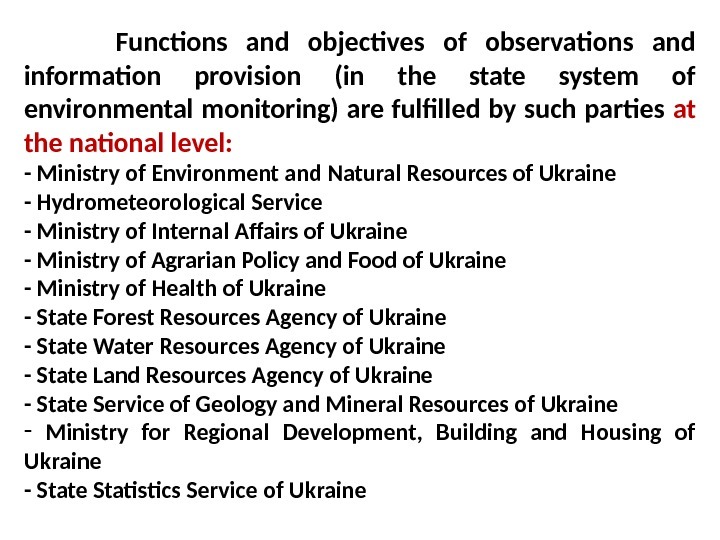 In Ukraine, the work of the monitoring bodies is regulated by the statutory and methodological documents. 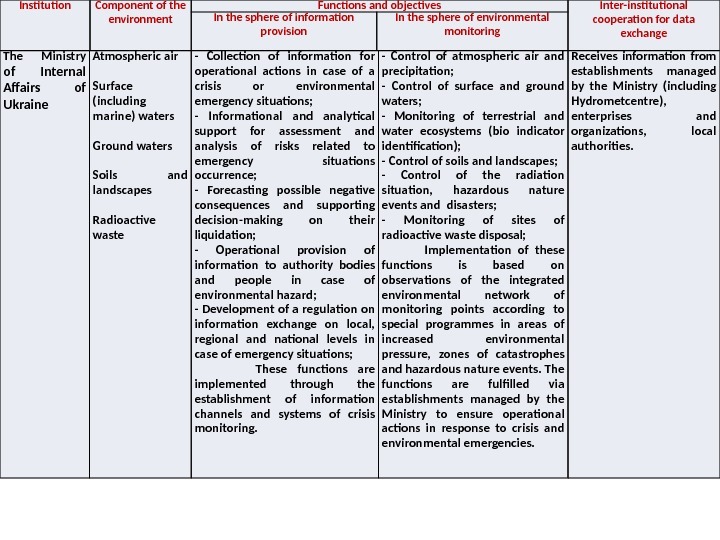 The only principle that is adopted in these documents is the environmental (different components of environment) approach in the monitoring i. e. monitoring of air, surface waters, ground water, geological environment, etc. Inter-institutional cooperation in environmental sector Institution Component of the environment Functions and objectives Inter-institutional cooperation for data exchange In the sphere of information provision In the sphere of environmental monitoring Inter-agency Commission on the issues of environmental monitoring All components — Coordination of activity of bodies of environmental monitoring; — Consideration of general issues related to monitoring on the national and regional levels; — Coordination of activity of the bodies of environmental monitoring; — Consideration of general issues of the state and regional level related to monitoring; Receives information from: — the Ministry of Environment and Natural Resources of Ukraine, — the Ministry of Internal Affairs of Ukraine, — the Ministry of Health of Ukraine, — the Ministry of Agrarian Policy and Food of Ukraine, — State Forest Resources Agency of Ukraine, — State Water Resources Agency of Ukraine, — State Land Resources Agency of Ukraine, — the Ministry for Regional Development, Building and Housing of Ukraine, — State Service for Geology and Mineral Resources (Subsoil) of Ukraine, — State Statistics Service of Ukraine, — enterprises and organizations, local authorities. Institution Component of the environment Functions and objectives Inter-institutional cooperation for data exchange. In the sphere of information provision In the sphere of environmental monitoring The Ministry of Environment and Natural Resources of Ukraine Atmospheric air Sources of emissions Surface (including marine water) Sources of discharge Ground waters Soils and landscapes Waste — Observations, collection and accumulation of data, analysis of the state of natural environments and prediction of changes; — Information and analytical support of a decision-making process related to natural environment protection, use of natural resources and ecological safety; — Informational services to power bodies and provision of environmental information to the population and international organizations; — Management of information systems and databases on the components of the environment; — Development of a regulation on information exchange at local, regional and national levels; These functions are implemented via establishment of information monitoring systems and databases of environmental indicators to support managerial decisions, provision of information to power bodies and the population about the state of natural environment. — Control of atmospheric air; — Control of sources of industrial emissions; — Control of surface and marine waters; — Control of sources of sewage water discharge; — Control of water objects in nature protected territories; — State of soils of various designation; — Geochemical state of landscapes; — Control of industrial and household waste dumps. 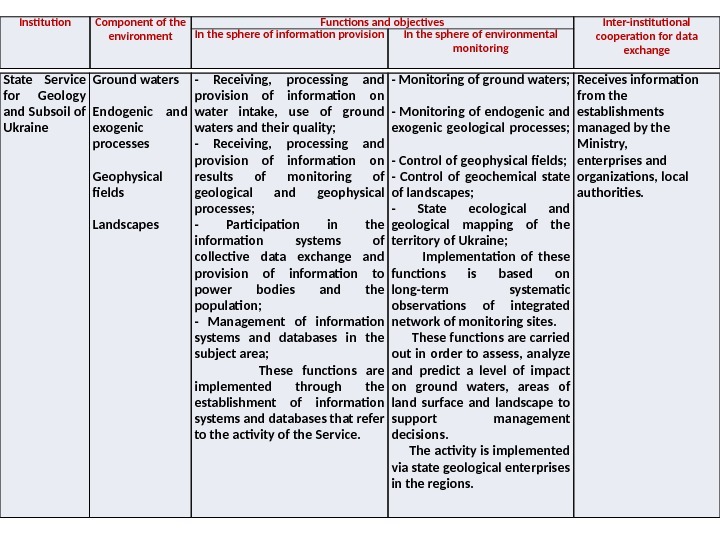 Implementation of these functions is based on long-term systematic observations of the integrated environmental network of monitoring points. The functions are carried out to assess, analyze and predict the state of natural environment to support managerial decisions. 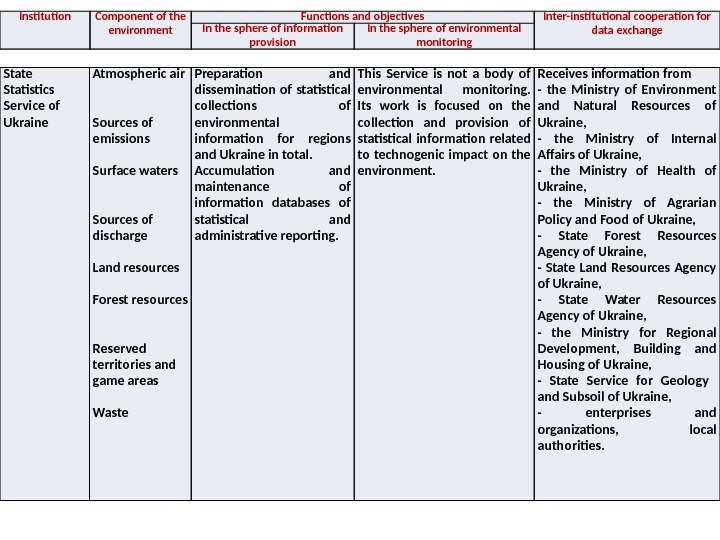 This activity is fulfilled via State Environmental Inspection of Ukraine and institutions that are managed by the Ministry Receives information from — the Ministry of Internal Affairs of Ukraine, — the Ministry of Health of Ukraine, — the Ministry of Agrarian Policy and Food of Ukraine, — State Forest Resources Agency of Ukraine, — State Water Resources Agency of Ukraine, — State Land Resources Agency of Ukraine, — State Services for Geology and Mineral Resources of Ukraine, — State Statistics Services of Ukraine, — enterprises and organizations, local authorities. Institution Component of the environment Functions and objectives Inter-institutional cooperation for data exchange. 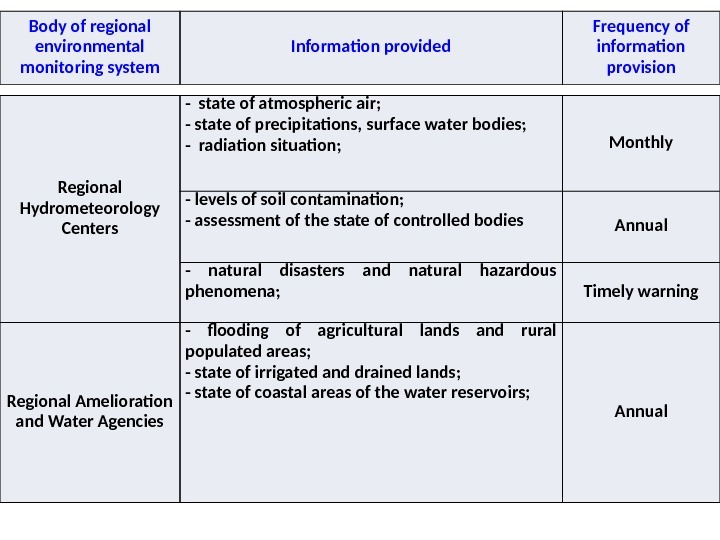 In the sphere of information provision In the sphere of environmental monitoring The Ministry of Internal Affairs of Ukraine Atmospheric air Surface (including marine) waters Ground waters Soils and landscapes Radioactive waste — Collection of information for operational actions in case of a crisis or environmental emergency situations; — Informational and analytical support for assessment and analysis of risks related to emergency situations occurrence; — Forecasting possible negative consequences and supporting decision-making on their liquidation; — Operational provision of information to authority bodies and people in case of environmental hazard; — Development of a regulation on information exchange on local, regional and national levels in case of emergency situations; These functions are implemented through the establishment of information channels and systems of crisis monitoring. — Control of atmospheric air and precipitation; — Control of surface and ground waters; — Monitoring of terrestrial and water ecosystems (bio indicator identification); — Control of soils and landscapes; — Control of the radiation situation, hazardous nature events and disasters; — Monitoring of sites of radioactive waste disposal; Implementation of these functions is based on observations of the integrated environmental network of monitoring points according to special programmes in areas of increased environmental pressure, zones of catastrophes and hazardous nature events. The functions are fulfilled via establishments managed by the Ministry to ensure operational actions in response to crisis and environmental emergencies. Receives information from establishments managed by the Ministry (including Hydrometcentre), enterprises and organizations, local authorities. Institution Component of the environment Functions and objectives Inter-institutional cooperation for data exchange. 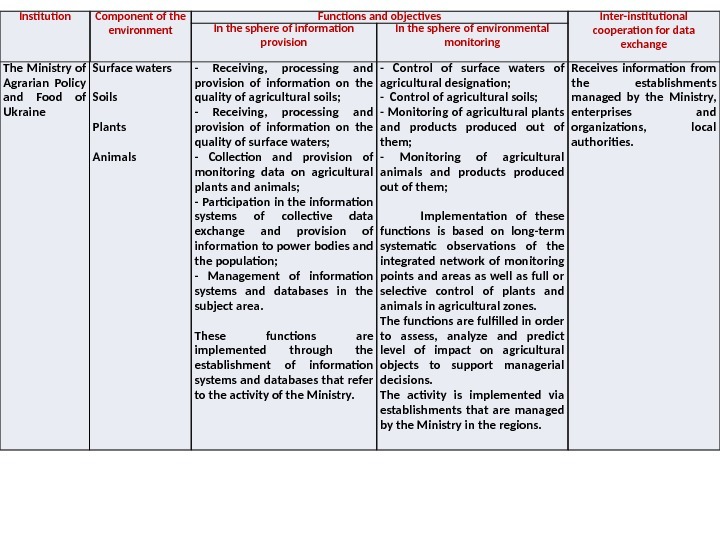 In the sphere of information provision In the sphere of environmental monitoring The Ministry of Agrarian Policy and Food of Ukraine Surface waters Soils Plants Animals — Receiving, processing and provision of information on the quality of agricultural soils; — Receiving, processing and provision of information on the quality of surface waters; — Collection and provision of monitoring data on agricultural plants and animals; — Participation in the information systems of collective data exchange and provision of information to power bodies and the population; — Management of information systems and databases in the subject area. These functions are implemented through the establishment of information systems and databases that refer to the activity of the Ministry. — Control of surface waters of agricultural designation; — Control of agricultural soils; — Monitoring of agricultural plants and products produced out of them; — Monitoring of agricultural animals and products produced out of them; Implementation of these functions is based on long-term systematic observations of the integrated network of monitoring points and areas as well as full or selective control of plants and animals in agricultural zones. The functions are fulfilled in order to assess, analyze and predict level of impact on agricultural objects to support managerial decisions. The activity is implemented via establishments that are managed by the Ministry in the regions. Receives information from the establishments managed by the Ministry, enterprises and organizations, local authorities. Institution Component of the environment Functions and objectives Inter-institutional cooperation for data exchange. In the sphere of information provision In the sphere of environmental monitoring State Forest Resources Agency of Ukraine Soils Forest vegetation Game fauna — Receiving, collection and provision of information on the state of lands of forest fund; — Receiving, processing and provision of information on the state of forest vegetation and game fauna; — Participation in the information systems of collective data exchange and provision of information to authorities and population; — Management of information systems and databases in the subject area; These functions are implemented through establishment of information systems and databases that refer to the activity of the Agency. — Control of soils and lands of forest fund; — Control of the state of forest vegetation; — Control of the state of game fauna; Implementation of these functions is based on long-term systematic observations of the integrated network of monitoring areas as well as full or selective control of plants and animals in the forest fund areas. 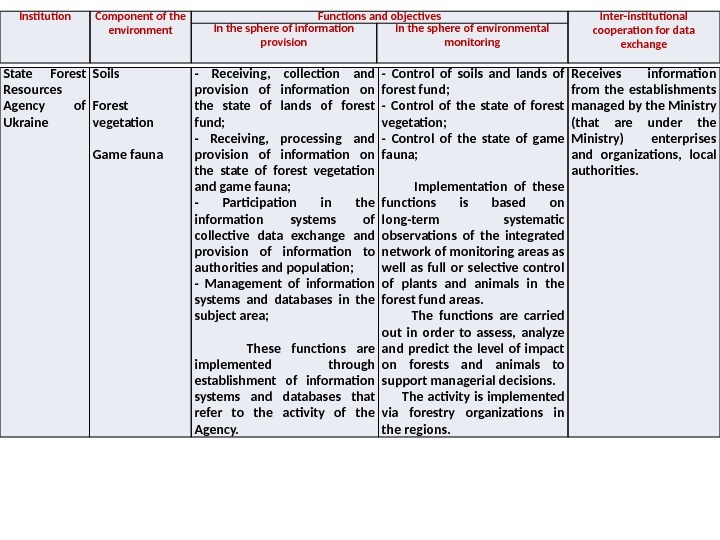 The functions are carried out in order to assess, analyze and predict the level of impact on forests and animals to support managerial decisions. The activity is implemented via forestry organizations in the regions. Receives information from the establishments managed by the Ministry (that are under the Ministry) enterprises and organizations, local authorities. Institution Component of the environment Functions and objectives Inter-institutional cooperation for data exchange. 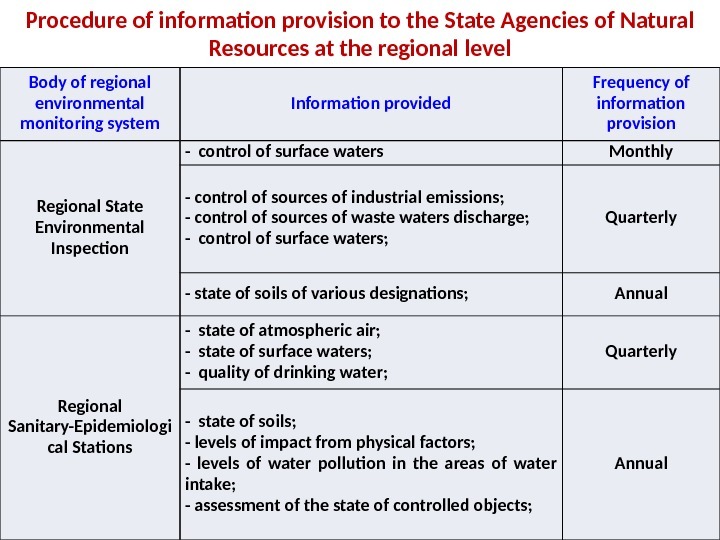 In the sphere of information provision In the sphere of environmental monitoring State Water Resources Agency of Ukraine Water objects and water bodies Surface waters Irrigated and drained lands Submergence area — Receiving, processing and provision of information on water intake, use of fresh water and discharge of sewage waters; — Receiving, processing and provision of information about the quality of surface waters; — Participation in information systems of collective data exchange and provision of information to power bodies and population; — Management of information systems and databases in the subject area. These functions are implemented through establishment of information systems and databases that refer to the activity of the Agency. — Control of the state of rivers, water reservoirs, canals, water areas within boundaries of water utilization systems; — Control of the state of water bodies in areas impacted by nuclear power stations; Monitoring of surface waters in border regions; Control of irrigated and drained lands; Implementation of these functions is based on long-term systematic observations of the integrated network of monitoring posts and areas. The functions are carried out in order to assess, analyze and predict a level of impact on water resources to support managerial decisions. The activity is implemented via Basin Agencies of Water Resources and Water Organizations in the regions. Receives information from the establishments managed by the Ministry, enterprises and organizations, local authorities. Institution Component of the environment Functions and objectives Inter-institutional cooperation for data exchange. 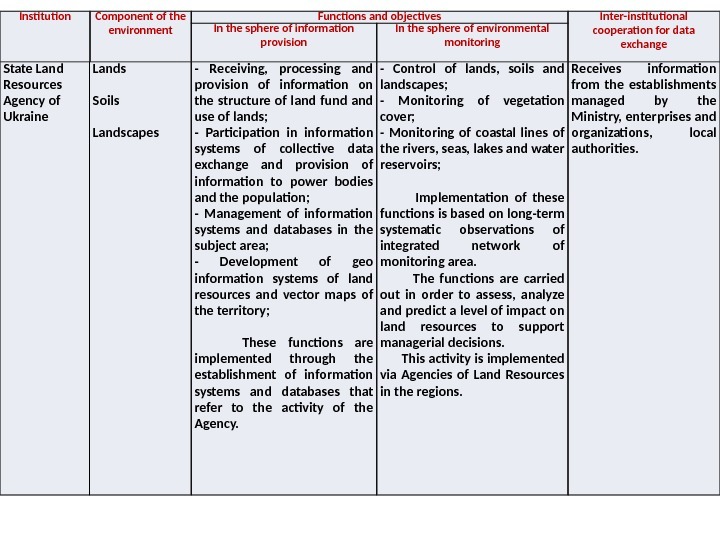 In the sphere of information provision In the sphere of environmental monitoring State Land Resources Agency of Ukraine Lands Soils Landscapes — Receiving, processing and provision of information on the structure of land fund and use of lands; — Participation in information systems of collective data exchange and provision of information to power bodies and the population; — Management of information systems and databases in the subject area; — Development of geo information systems of land resources and vector maps of the territory; These functions are implemented through the establishment of information systems and databases that refer to the activity of the Agency. — Control of lands, soils and landscapes; — Monitoring of vegetation cover; — Monitoring of coastal lines of the rivers, seas, lakes and water reservoirs; Implementation of these functions is based on long-term systematic observations of integrated network of monitoring area. The functions are carried out in order to assess, analyze and predict a level of impact on land resources to support managerial decisions. This activity is implemented via Agencies of Land Resources in the regions. Receives information from the establishments managed by the Ministry, enterprises and organizations, local authorities. Institution Component of the environment Functions and objectives Inter-institutional cooperation for data exchange. In the sphere of information provision In the sphere of environmental monitoring The Ministry for Regional Development, Building and Housing of Ukraine Drinking water Sewage waters Green plantations Submergence areas — Receiving, processing and provision of information on the quality of drinking water and sewage waters; — Receiving, processing and provision of information on monitoring results of green plantations; — Participation in the information systems of collective data exchange and provision of information to power bodies and the population; — Management of information systems and databases in the subject area; These functions are implemented through the establishment of information systems and databases that refer to the activity of the Ministry. 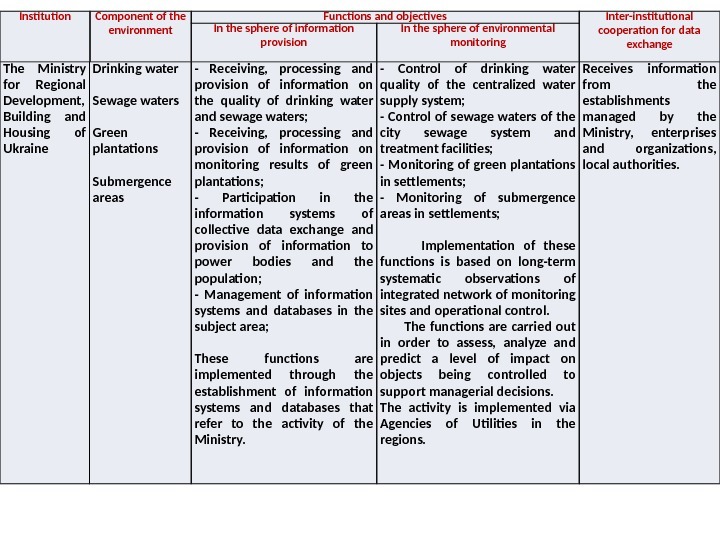 — Control of drinking water quality of the centralized water supply system; — Control of sewage waters of the city sewage system and treatment facilities; — Monitoring of green plantations in settlements; — Monitoring of submergence areas in settlements; Implementation of these functions is based on long-term systematic observations of integrated network of monitoring sites and operational control. The functions are carried out in order to assess, analyze and predict a level of impact on objects being controlled to support managerial decisions. The activity is implemented via Agencies of Utilities in the regions. Receives information from the establishments managed by the Ministry, enterprises and organizations, local authorities. Institution Component of the environment Functions and objectives Inter-institutional cooperation for data exchange. 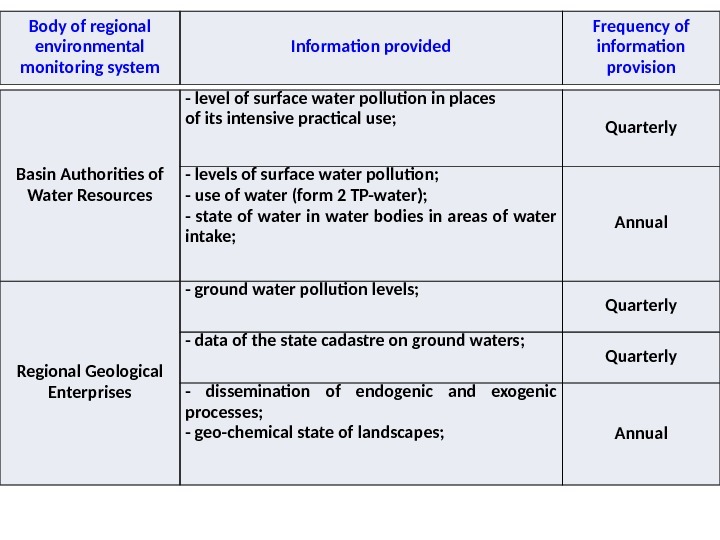 In the sphere of information provision In the sphere of environmental monitoring State Service for Geology and Subsoil of Ukraine Ground waters Endogenic and exogenic processes Geophysical fields Landscapes — Receiving, processing and provision of information on water intake, use of ground waters and their quality; — Receiving, processing and provision of information on results of monitoring of geological and geophysical processes; — Participation in the information systems of collective data exchange and provision of information to power bodies and the population; — Management of information systems and databases in the subject area; These functions are implemented through the establishment of information systems and databases that refer to the activity of the Service. — Monitoring of ground waters; — Monitoring of endogenic and exogenic geological processes; — Control of geophysical fields; — Control of geochemical state of landscapes; — State ecological and geological mapping of the territory of Ukraine; Implementation of these functions is based on long-term systematic observations of integrated network of monitoring sites. These functions are carried out in order to assess, analyze and predict a level of impact on ground waters, areas of land surface and landscape to support management decisions. The activity is implemented via state geological enterprises in the regions. Receives information from the establishments managed by the Ministry, enterprises and organizations, local authorities. Institution Component of the environment Functions and objectives Inter-institutional cooperation for data exchange. 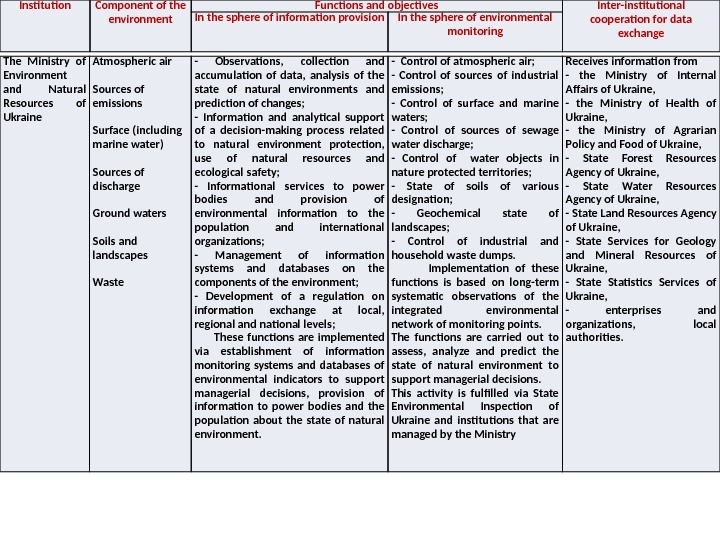 In the sphere of information provision In the sphere of environmental monitoring State Statistics Service of Ukraine Atmospheric air Sources of emissions Surface waters Sources of discharge Land resources Forest resources Reserved territories and game areas Waste Preparation and dissemination of statistical collections of environmental information for regions and Ukraine in total. Accumulation and maintenance of information databases of statistical and administrative reporting. This Service is not a body of environmental monitoring. Its work is focused on the collection and provision of statistical information related to technogenic impact on the environment. Receives information from — the Ministry of Environment and Natural Resources of Ukraine, — the Ministry of Internal Affairs of Ukraine, — the Ministry of Health of Ukraine, — the Ministry of Agrarian Policy and Food of Ukraine, — State Forest Resources Agency of Ukraine, — State Land Resources Agency of Ukraine, — State Water Resources Agency of Ukraine, — the Ministry for Regional Development, Building and Housing of Ukraine, — State Service for Geology and Subsoil of Ukraine, — enterprises and organizations, local authorities. 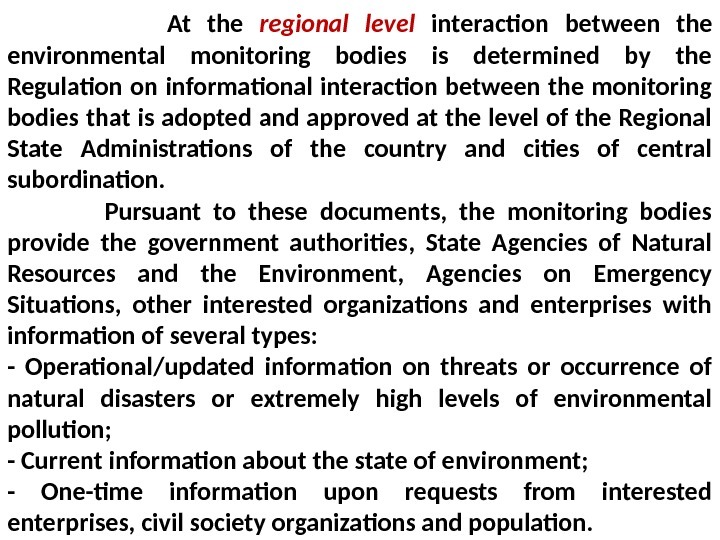 At the regional level interaction between the environmental monitoring bodies is determined by the Regulation on informational interaction between the monitoring bodies that is adopted and approved at the level of the Regional State Administrations of the country and cities of central subordination. Pursuant to these documents, the monitoring bodies provide the government authorities, State Agencies of Natural Resources and the Environment, Agencies on Emergency Situations, other interested organizations and enterprises with information of several types: — Operational/updated information on threats or occurrence of natural disasters or extremely high levels of environmental pollution; — Current information about the state of environment; — One-time information upon requests from interested enterprises, civil society organizations and population. 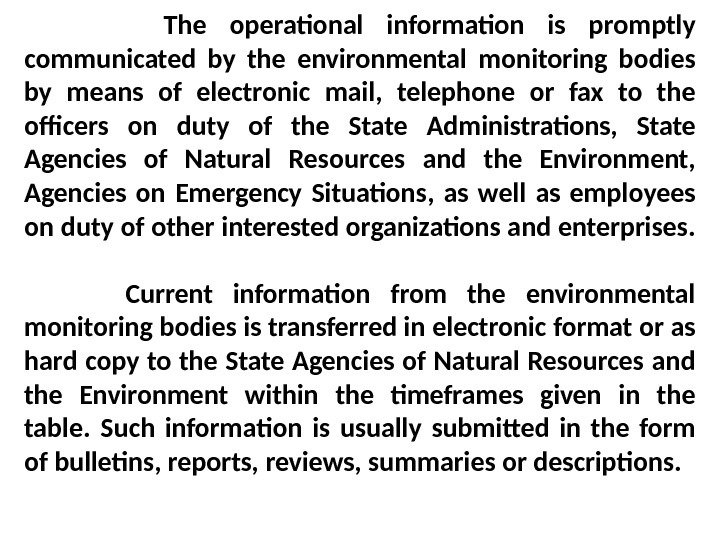 The operational information is promptly communicated by the environmental monitoring bodies by means of electronic mail, telephone or fax to the officers on duty of the State Administrations, State Agencies of Natural Resources and the Environment, Agencies on Emergency Situations, as well as employees on duty of other interested organizations and enterprises. Current information from the environmental monitoring bodies is transferred in electronic format or as hard copy to the State Agencies of Natural Resources and the Environment within the timeframes given in the table. Such information is usually submitted in the form of bulletins, reports, reviews, summaries or descriptions. 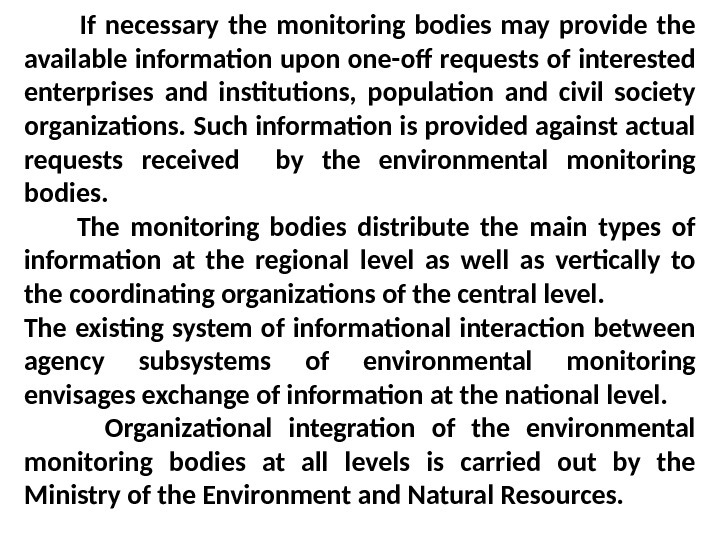 If necessary the monitoring bodies may provide the available information upon one-off requests of interested enterprises and institutions, population and civil society organizations. Such information is provided against actual requests received by the environmental monitoring bodies. The monitoring bodies distribute the main types of information at the regional level as well as vertically to the coordinating organizations of the central level. 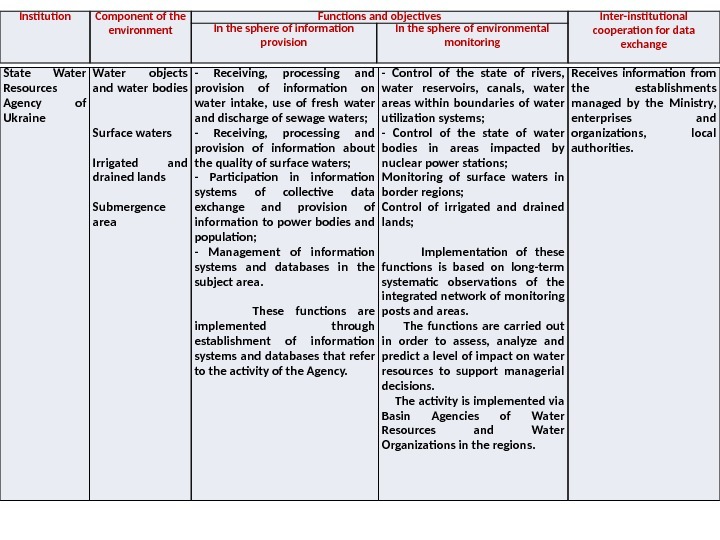 The existing system of informational interaction between agency subsystems of environmental monitoring envisages exchange of information at the national level. 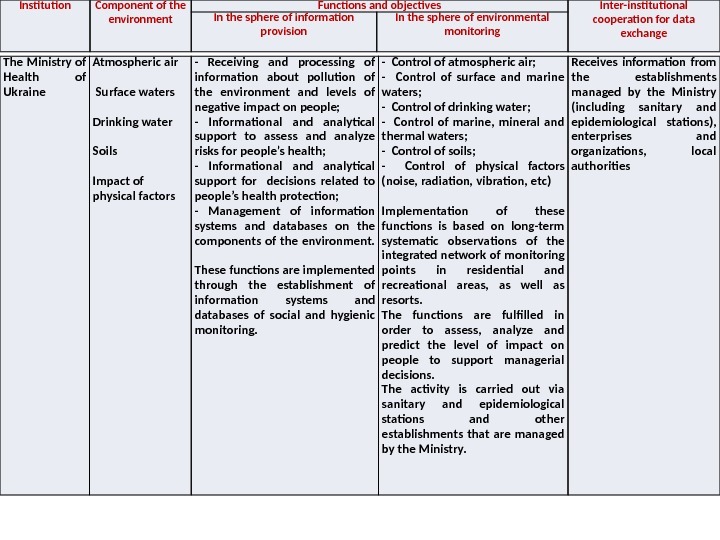 Organizational integration of the environmental monitoring bodies at all levels is carried out by the Ministry of the Environment and Natural Resources.